The blogger said that she had tried for months to reach the U.S. president through different channels. Sánchez said she had sent written questions to Obama through a wide range of different people before the White House responded. On her blog Generación Y, where she has posted Obama’s answers to her seven questions, Sánchez explained that the questions were based on issues “that keep me from sleeping,” and were born from her personal experience. “It was a very pleasant surprise,” Sánchez said, acknowledging that the chances that Obama would reply were minimal. Before responding to the questions, Obama thanked Sánchez for the opportunity to exchange views with her and her readers in Cuba, and congratulated her for receiving Columbia’s University Maria Moors Cabot Award for excellence in Latin American reporting. When the history of Cuba’s freedom movement is written, it’s likely that Yoani Sanchez will be recognized as a national hero and freedom fighter, the equivalent of Lech Walesa in Poland and Vaclav Klaus in the Czech Republic. 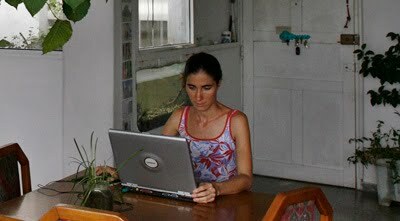 Yoani Sanchez demonstrates that we should never underestimate the power of one courageous individual with a computer, a blog, and intermittent access to the Internet, or the individual’s power to change the world in the Information Age, especially with a message of freedom and individual liberty. The fact that the president of the United States, who is often recognized as the most powerful person in the world, has praised Yoani Sanchez’s blog and responded to her questions is a remarkable and historical event. Intellectual figures like Milton Friedman, Friedrich von Hayek, and Thomas Jefferson would be proud of Yoani Sanchez and her powerful message of individual freedom in one of the few remaining regimes of totalitarianism left in the world. So in Iran where people are being arrested, tortured, and killed, it's up to them to deal with. But Cuba, well no problem standing up for a voice of opposition. Pretty easy standing up to a country that can't do anything versus a country that can shut the Strait of Hormuz and spike oil prices. How could you invoke Thomas Jefferson's name as if he truly cared about individual freedom, when, in fact, Jefferson was a man who paid lip service to ideas of liberty and justice for he was a slave-owner himself, like so many of the other "founding fathers" and "patriots". Jefferson knew that what he was doing was not only morally reprehensible, but entirely against everything for which he was fighting, and yet he still held these people as slaves! Jefferson liked freedom and liberty only for people like himself.....but if you happened to be a black, then it was okay for him and his ilk to own you. To be clear, Thomas Jefferson was a hypocrite who talked a big game about liberty and justice, but was an abject failure because he lacked the courage to follow his passionate convictions. He was a pure coward. Libertarians like you have some serious explaining to do when you look to Thomas Jefferson as some example of moral superiority. So next time you criticize some non-libertarians in a holier-than-thou manner for conveniently sweeping facts under the rug, perhaps you should get your act together. Jefferson was a realist. He knew there would be no country if slavery was to be ended at its founding. While many founding fathers had salves, many also freed them. Trying to turn a section of society 180 degrees in thought overnight is just being silly. Pingry, Yes Jefferson owned slaves or what he might call them, servants. By his request five members of the Hemmings family were freed after his death. Some of the ideas that Jefferson highly influenced were in Virgina's consttution before the U.S. Constitution were: Complete Religious freedom and a system of government for an independent judiciary, bicameral legislature and weak executive called an administrator. These are ideas that endure in the U.S. and more so every day around the world -- except for the regretable strenghtening of the executive. Jefferson's leadership in continually debating and regenerating democratic institutions are enduring and world changing. He should have disavowed slavery but he set a foundation that even the descendants of slavery can be grateful for. Spare us the leftist drivel. Slavery was an ancient and established institution, encompassing every corner of the globe in Jefferson's world. He inherited not only slaves, but huge debts which would have made it impossible for him to free his slaves since they would have had to have been sold to extinguish those debts. Thomas Jefferson wrote the document that gave voice to individual liberty and the truth that man's rights are invested by God and are not the gift of other men. He despised the institution of slavery and foresaw the Civil War, predicting that institutionalized slavery would eventually tear the country apart. Jefferson, and the rest of the Founding Fathers, set in motion a system of government and economics that has resulted in the greatest advancement of human liberty and material enrichment the world has ever known. The true human slaveholders have been the socialists who have enslaved entire nations, killing tens of millions and denying the potential of hundreds of millions more. The only coward in this discussion is you. After defeating George Foreman for the heavyweight title in Zaire, Muhammad Ali returned to the United States where he was asked by a reporter, "Champ, what did you think of Africa?" Ali replied, "Thank God my granddaddy got on that boat." To hold 18th century figures to the current environment is less than fair. Recall that to end slavery in the US took between 618000 and 700000 killed out of a population of 30 million, a rate of 2.6% of the population. Practically also it was the British abolition of slavery in 1833 that did the institution in. It also ended the deadliest form of slavery the sugar plantation slavery which literally worked slaves to death. It was this movement that prevented Britain from following its economic interest and backing the south, since a lot of British industry depended on Southern American Cotton at the time. Jefferson was not perfect in our eyes, but then he was not perfect for different reasons to his contemporaries. He unleashed ideas that are still evolving and growing in ways he could not have predicted, but then often one can not see the long term consequences of his actions. Sure one could call him a hypocrite, but who is not one in one sense or another? If want wants to rail against Jefferson's original intent talk about women who were also unpersons at the time. A former State Department official and his wife admitted in federal court Friday that they spied for Cuba over the past three decades, receiving coded instructions over a shortwave radio and passing along information to intelligence operatives in "dead drops" and "hand-to-hand" passes. Walter K. Myers, 72, pleaded guilty to conspiring to commit espionage and wire fraud. His wife, Gwendolyn Steingraber Myers, 71, pleaded guilty to conspiring to gather and transmit national defense information. The couple's attorney, Bradford Berenson, said in a statement after the hearing that the Myerses were not motivated by greed but spied "out of conscience and personal commitment." Over the years, Myers memorized secret documents or borrowed them from work and then gave copies to Cuban agents, authorities said. The couple also met their handlers during overseas trips. In 1995, they visited Cuba using false names and spent an evening with Castro, court papers allege. Under the plea deal, the couple agreed to forfeit $1.7 million, the total of Myers's salary over the years, in cash and property to the U.S. government. That includes a prized 37-foot Malo sailboat. While Yoani risks beatings, prison or worse, this POS was working overtime for Castro and Raul, making sure that their boot remained firmly planted on the necks of the Cuban people. Amo te Yoani Sanchez. ¡No! Yo no soy tu hermano, pero yo soy tu hermano auxiliar, y yo te amo. Usted debe escuchar. Yoani debe escuchar a la voz callada dentro de ella. Escuche a la voz de mil hermanos y cien padres. La voz dice "Ella debe desistir ahora". Yoani nos permitirá ahora terminar tu trabajo. Ésta no es la Bahía de Cerdo. Éste no es otro fracaso. Éste es el corte final, la huelga firme de muerte contra el tirano. Nosotros hemos puesto sus patos en una formación de pavos agonizantes. Siéntese tranquilo. Relaje. Mire el juego de una gran distancia. El drama de muerte será tan breve como la espada del matador que encuentra su destino rápidamente. El golpe de relámpago será más rápido que el ojo de Yoani..
Usted debe desaparecer. Mueva lejos de las armas. Mueva lejos de las computadoras. Evite el peligro. I love you Yoani Sanchez. Not! I am not your brother, but I am your auxiliary brother, and I love you. You must listen. Yoani must listen to the voice kept silent inside her. Listen to the voice of thousand brothers and hundred fathers. The voice says " She must desist now ". Yoani will allow us now to finish your work. This is not the Bay of Pig. This is not another defeat. This is the final court, the firm strike of death against the tyrant. We have put his ducks in a formation of agonizing turkeys. Feel calmly. Relax. Look at the game of a big distance. The drama of death will be so brief as the sword of the killer who finds his destination rapidly. The blow of lightning will be more rapid than the eye of Yoani..
You must disappear. Move far from the weapon. Move far from the computers. Avoid the danger. What is missed here is the answers of Barrack Obama. What of them...are they so platitudinous that Thomas Jefferson becomes the hot topic of conversation? Last time, I looked Tom wasn't running the most powerful nation in the world and making a dog's dinner of U.S. foreign policy. I like history as well as the next man but shouldn't we be discussing either the situation in Cuba or President Obama's posturing. But most of all QT means kindness. "the equivalent of Lech Walesa in Poland and Vaclav Klaus in the Czech Republic." you probably mean Vaclav Havel, the first president of the Czech. Rep. Vaclav Klaus is the current president of Czech Rep. he is the only leader in EU who is against the global warming hystery. respect to him. but he had nothing to do with the velvet revolution. anyway, thank you for this amazing blog Mike!! !